American manned lunar base. 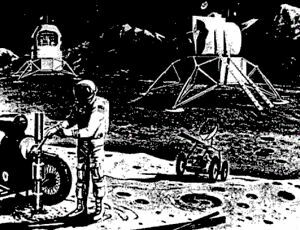 Cancelled 1968. AES (Apollo Extension Systems) was planned as the first American lunar base. It would involve minimal modification of Apollo hardware. The Apollo CSM would be modified for long duration lunar orbit storage. AKA: Apollo Extension Systems. Status: Cancelled 1968. Two versions of the Apollo LM would be developed: the LM Taxi, and the LM Shelter. Surface mobility would be provided by an open cab lunar rover within the 2050 kg lunar surface payload capability of the LM Shelter. This preliminary base would require two Saturn V launches to allow two astronauts to explore the vicinity of their LM Shelter over a two week period. Development was actually begun in May 1966 with plans for a first mission in March 1970. But subsequent cutbacks and then cancellation of further Saturn V production led to the project being completely abandoned in June 1968. Production of additional Saturn V vehicles, with launches to start in 1970. Extended CSM, as developed for the Extended Life Orbital Missions of Apollo Applications. Definition began in mid-1965, with development starting in April 1966 and fabrication in spring 1967. First article would be delivered for payload integration in April 1969 with first flight in February 1970. The Extended CSM had the capability to operate with one astronaut for 30 days in lunar orbit. This affected primarily consumables (Lox/H2 for the fuel cells, RCS propellants, food, gases, and other life support consumables). LEM Shelter. Definition began in mid-1965, and with development starting in September 1966 and fabrication in February 1967, first flight would be in February 1970. The LM Shelter replaced the propellants and engine of the basic LM ascent stage with necessary consumables to support two weeks of lunar exploration. LEM Taxi. Definition began in mid-1965, and with development starting in May 1966 and fabrication in September 1967, first flight would be in April 1970. The LM Taxi could deliver (but not house) two astronauts to the surface and return them to an orbiting CSM after a two-week lunar surface stay in the separately-landed shelter. The LM Taxi was an LM modified slightly to give it the capability for a 14-day quiescent (inactive) lunar stay time, in addition to 3 days (active) operational time. Lunar mobility vehicles - NASA studied a vast array of rovers, hoppers, crawlers, walkers, and even worms over the years. The AES vehicles (probably an open-cabin rover and a short-distance hopper) would have to be accommodated within the 2050 kg surface payload of the lunar shelter. No go-ahead for development of a specific model was given prior to AES cancellation. The two-man, open-cab lunar rover actually used beginning with the Apollo 15 mission was a relatively trivial development when NASA was at its peak. Development was authorized in May 1969; Boeing was selected as contractor in October 1969; and the first rover was on the moon in July 1971. In the AES scenario the LM Shelter would be delivered by a Saturn V launch sending a manned Apollo CSM and the LM Shelter towards the moon. As in a standard Apollo flight, the CSM would transpose and dock with the LM Shelter, and then pull it away from the S-IVB stage. After the CSM had braked the combination into lunar orbit, the automated LM Shelter would separate. The crew would merely orbit above the moon in the CSM until the automated LM Shelter had landed, and then return to Earth. A second Saturn V launch, using an Extended CSM and a LM Taxi, would transport a crew to the LM Shelter. Because of the expected interval between first and second landings, the LM Shelter would have to be given a 90-day quiescent capability. The second flight would land two of the crew using the LM Taxi while the 30-day CSM waited with a single astronaut in lunar orbit. After landing, the crew would shut down the LM Taxi and activate the shelter system. Two weeks later, the LM Taxi would be reactivated and the crew would return to the CSM and back to Earth. Mission duration could be doubled by modifying the S-IVB third stage of the Saturn V for operation in lunar space and by providing a 40-day quiescent capability for an unmanned CSM in lunar orbit. This would allow all three astronauts to be landed on the Moon for a 30-day stay time. June 1968: All post-Apollo lunar launches deleted. Evolution to a lunar base would have gone from the basic Apollo hardware to AES (Apollo Extension Systems) to ALSS (Apollo Logistics Support System using the LEM Truck), and then LESA (Lunar Exploration System for Apollo). The end result would be ever-expanding permanent stations on the moon. In a comparison lf lunar base approaches, the basic Apollo hardware scenario for thorough exploration of a single location would consist of a single manned lunar reconnaissance landing of the selected base site, followed by six Apollo launches over the next six quarters - total, 14 man-days on the moon for 7 Saturn V launches. The AES or ALSS approach would follow the single reconnaissance flight by three pairs of cargo landings and manned landings, resulting in a total of 86 man-days on the moon for the same number of Saturn V launches. The LESA approach, with a cargo lander followed by two manned landings in sequence to the same large shelter and rover, would allow 542 man-days on the moon. ALSS development would cost around $500 million, and LESA cost $1.45 billion. In terms of cost per man-day on the moon, either approach would pay off on the very first mission. Family: Lunar Bases, Moon. Country: USA. Spacecraft: Apollo CSM, Apollo LM Shelter, Apollo LM Taxi, LSSM, MOBEV F2B. Launch Vehicles: Saturn V.